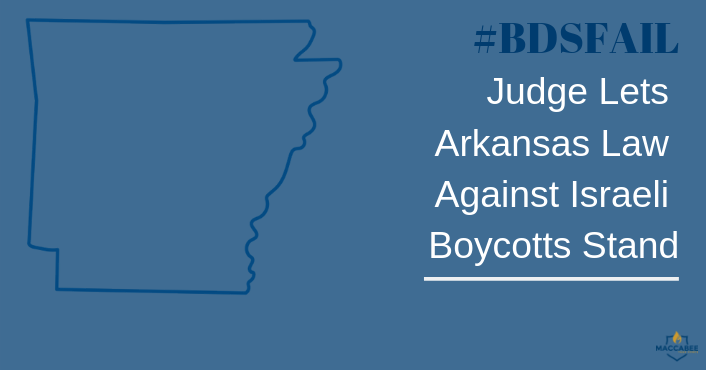 LITTLE ROCK — A federal judge on Wednesday let stand an Arkansas law requiring state contractors to pledge not to boycott Israel, ruling that such a boycott is not protected by the First Amendment. U.S. District Judge Brian Miller dismissed the lawsuit the Arkansas Times had filed challenging the 2017 law. The newspaper had asked the judge to block the law, which requires contractors with the state to reduce their fees by 20 percent if they don’t sign the pledge.